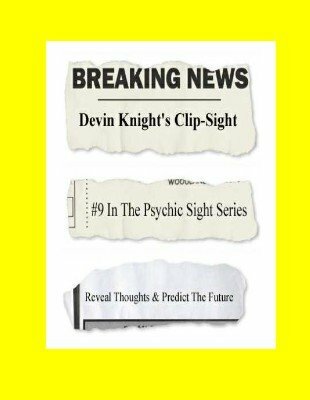 Release #9 in Devin Knight's Psychic Sight series. Clip-Sight is a utility tool that will allow you to create miracles that defy explanation. It is an improvement over an old Al Mann idea. You can do all of the below effects and MORE with this gimmick. These effects will not only fry your audiences they will fool the majority of magicians as well. None of the below effects require any sleight of hand! All are easy to do, yet are some of the most impossible effects ever created. This sold professionally made up for $59 in the past. You can easily make your own for a fraction of that! This effect alone is worth the price of the e-book. Before the show a lady is given a deck of cards to shuffle. She puts them behind her back and secretly reverses a card unknown to her. The cards are returned to the case and she is asked to keep the deck until asked for it during your show. During your show, a man comes up and is told to think of a card. You give him a slip of paper and asked him to secretly jot down his card but not to show you or the audience. Magician NEVER touches the paper the participant wrote on. The lady brings the deck forward, and the card she reversed is removed. The card she reversed turns out to be the same card the man just thought of. Neither person is a stooge or instant stooge. A person is handed a clipping from a newspaper (any newspaper and not specially printed). He is asked to look over the words in the article and focus on any word. To help him focus on the word you ask him to circle the word with a pencil. Once he does so he folds the clipping up concealing his circled word. All this is done while your back is turned. You give him an opaque envelope and asked him to drop the folded paper inside so it can't be tampered with. Magician never touches the folded newspaper at anytime nor is there any billet switch. Immediately with no fishing or questions, you reveal the word. NO SWITCHES of any kind. You can also have two people circle words and reveal both words. An extremely novel effect. A person is given a pen that contains invisible ink. While you turn your back he is asked to think of any word and write it on a piece of paper using the invisible ink. Later, he shows the paper to the audience who sees it is blank. You say, so actually you wrote nothing down, and the word is only in your mind. WITHOUT TOUCHING THE PAPER the performer reveals the word he just thought of. NO FISHING...100% sure fire! A new way to do a headline prediction that involves NO STOOGES, NO SLEIGHTS and NO SWITCHES. This is a one-man effect. A sealed envelope is mailed to a VIP who is asked not to open it and bring it to the show. The envelope is brought to the show and is seen to be sealed, with the seams covered with tape so that it is completely sealed and tamper proof. The performer has the VIP and several people sign their names on the envelope to ensure the same envelope is opened at the end of the show. At the end of the show the VIP opens the envelope and removes an index card from the inside. HE REMOVES THE INDEX CARD NOT YOU. Written on that card are the headlines for the day. NO nail writer or similar gimmicks used. POSITIVELY NO SWITCH OF THE ENVELOPE at any time. At the end the VIP can keep the envelope and predictions. EVERYTHING can be examined. These are just a small sampling of the effects possible with Clip-Sight. More are described in the directions. NO CHEMICALS of any kind are used in any of these effects. CLIP-SIGHT is one of the most devious gimmicks you will ever see and the miracles are only limited by your imagination!!! Complete directions on how to make your own clip-sight. Full details on how to make the board using a piece of clear plastic and a bull dog clip. Way underpriced for the miracles you are getting.